Supplier Diversity: Making Our Supply Chain Even Stronger! At CTDI, we're committed to doing business with minority, women, and disabled-veteran owned businesses as well as businesses who utilize people with disabilities because of our overall responsibility to the communities in which CTDI and its employees live. As it is also part of our customers' commitment to support their business and communities, CTDI will proactively assist them in meeting this commitment. The objective of CTDI's Supplier Diversity Program is to increase the amount of business awarded to minority, women, disabled-veteran owned businesses, and businesses who utilize people with disabilities by continually reviewing requirements for materials and services. 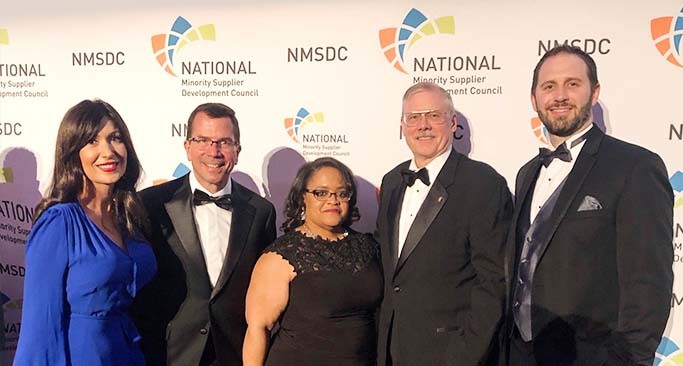 CTDI has been a corporate member of the National Minority Supplier Development Council (NMSDC) since 1995 and actively participates in the Technology Industry Group (TIG) of the NMSDC. CTDI is also a national corporate member of the Women's Business Enterprise National Council (WBENC) and a member of the Women's Business Enterprise Council of PA-DE-sNJ (a regional partner organization of WBENC). In Canada, CTDI participates in events organized by WBE Canada and the Canadian Aboriginal Minority Supplier Council (CAMSC). CTDI provides support for diverse suppliers through direct initiatives and informal assistance. Our company is always seeking to improve the procurement process and upgrade our Supply Chain partners for continuous improvement in the company bottom line and in responsiveness to our customers. Initial contact with potential suppliers may occur at the various Business Opportunity Fairs and Supplier Diversity events located throughout the United States and Canada. We encourage attendance at these events for greater networking opportunities with CTDI and our colleagues in the industry. CTDI can be contacted either directly through the Supplier Diversity organization or through the Procurement Group. As Supplier Diversity is included in the Corporate Procurement Group, this information gets distributed quickly to those people active in the commodity/service areas. We are always looking for companies who supply quality goods and services. No additional information other than contacting the Supplier Diversity organization with your diversity certificate at supplierdiversity@ctdi.com is necessary as CTDI does not use a separate portal – we prefer a more direct method. If you qualify as a Diverse Supplier and have been certified by a third-party certifying body, additional support is available to you in identifying opportunities within CTDI from CTDI’s Supplier Diversity program (supplierdiversity@ctdi.com).